In ye olde days of my metallic painting, I would paint the base coat over black, then layer it like I would colors, or maybe drybrush each new lighter silver over the next. While drybrushing definitely speeds up painting metallics, I never really cared for it. 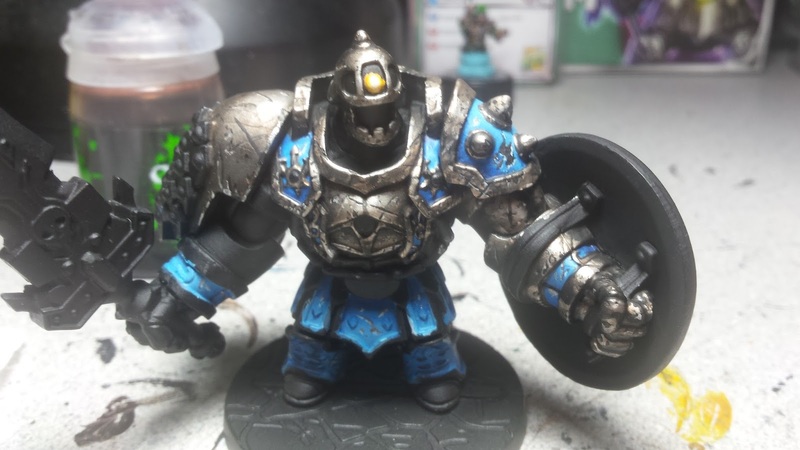 The early stages of this goal can be seen with the Super Dungeon Explore Iron Golem, which looks great, but the way I went about painting him took forever and I need to speed up the process. With the Iron Golem, I prehighlighted every metallic surface with white over a black base coat, like I had on the Cryx Deathripper for its red paint. The problem is, while it sped up the Deathripper's paint job, it actually slowed down the metallics. This surprised me a little. So, I decided to ditch that step on the dwarf. 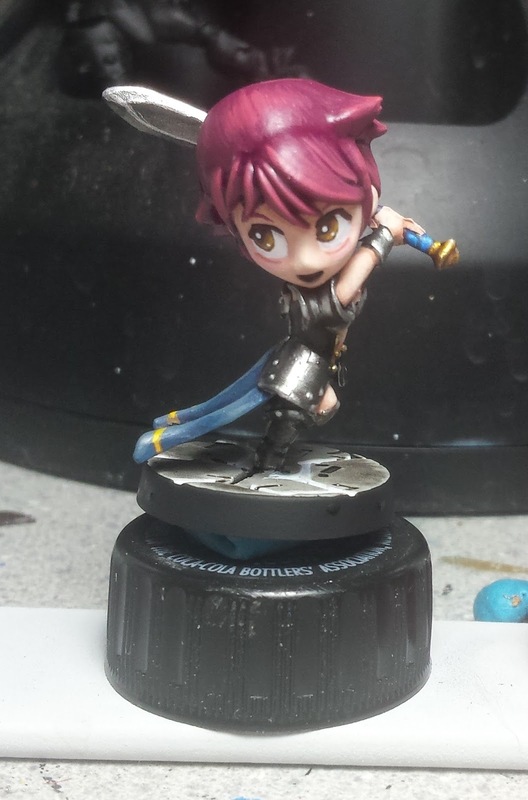 A few months back I decided to try painting True Metallic Metals (TMM) as if I was painting Non-Metallic Metals (NMM) and painted Shojo's metals with it. While it didn't turn out exactly how I was picturing in my head, it laid the groundwork and I used what I learned there for the Iron Golem. The nice thing about TMM is that the metallic flake in the paint makes the metals shine. But that is also the biggest issue with it. It is hard to photograph and when you move it around the metallic shine changes depending on the way the light hits it. Another issue I have is that the darkest metallic paint from Citadel, Leadbelcher, is actually not dark enough to give good contrast. If you start with a Leadbelcher base coat over everything with a Ironbreaker highlight and a Stormhost Silver spot highlight, the final highlight sometimes gets lost. That said, I now mix Leadblecher and Black together to make a darker metallic to deepen contrast. The other problem is, since Leadbelcher is a metallic, the shadowy areas will still shine, hiding details a little. Of course, if you are drybrushing the deep recesses still have black in them and it helps show the details. That's where my next fix came to mind. 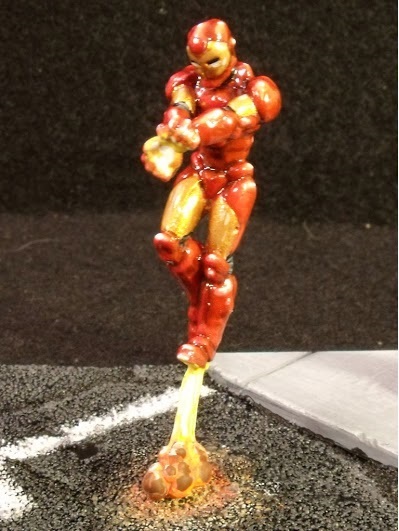 I actually figured this trick out a couple years ago while painting Iron Man. 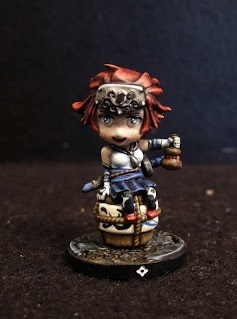 For that mini, I had glossed the entire thing after painting was finished and then realized that the details were impossible to make out. So I went over every rivet and seam with a dark red and that fixed the problem. The picture of Iron Man to the right is actually of him before I fixed it. Taking what I learned from Iron Man's armor, if I blend in black to the recesses and under areas, the shine will go away and the shadows will deepen. One other thing is, I cover my models in Testor's Dullcote, which is a matte finish spray. This takes shine out of the metallic even more. But if I go over the armor with gloss coat after the fact, it returns me to the problem of it being too shiny. That's when I realized I can use the Citadel 'ardcoat gloss varnish as a spot gloss and add it to only the highest highlight areas to make them really shine. I've done this on Brave-Mode Candy recently and I really like the result. Now the goal is to bring it all together on this dwarf and over the course of the year tweak it and improve it until I have TMM down and looking amazing. The biggest hurdle for me has always been blades and I need to really work on that. 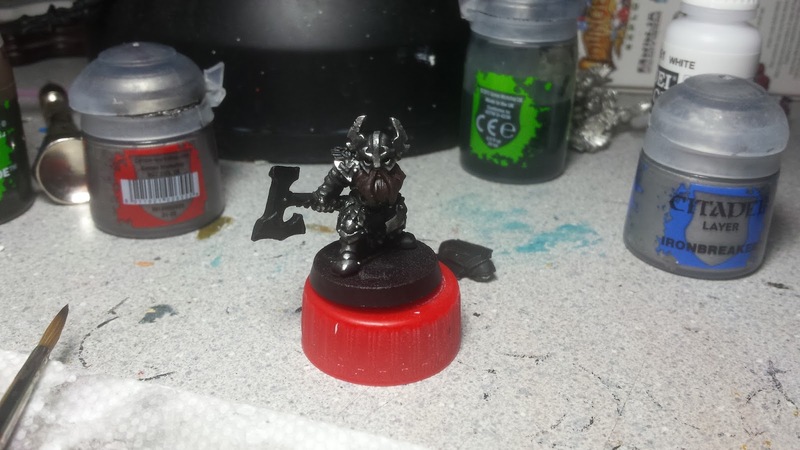 So far, the dwarf is looking solid, I haven't finished his armor yet though. Once the silver of the armor is all painted, I 'll start adding dings and scratches to it. I'll take what I learned there and translate it into bronze and gold too. 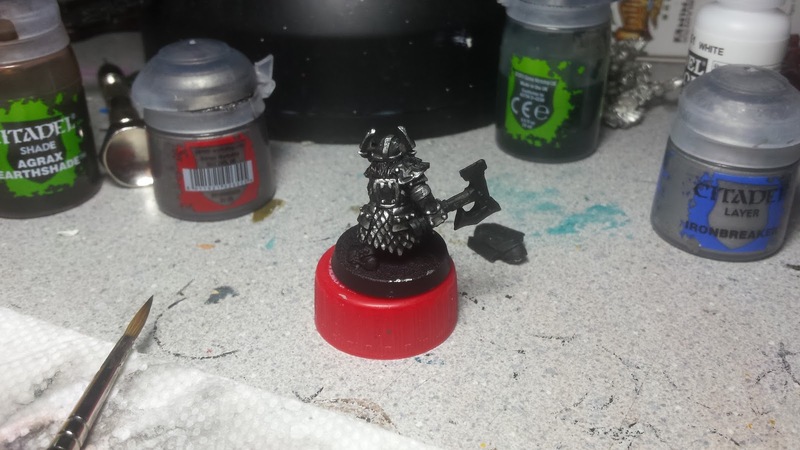 Here's the dwarf as of the other night. 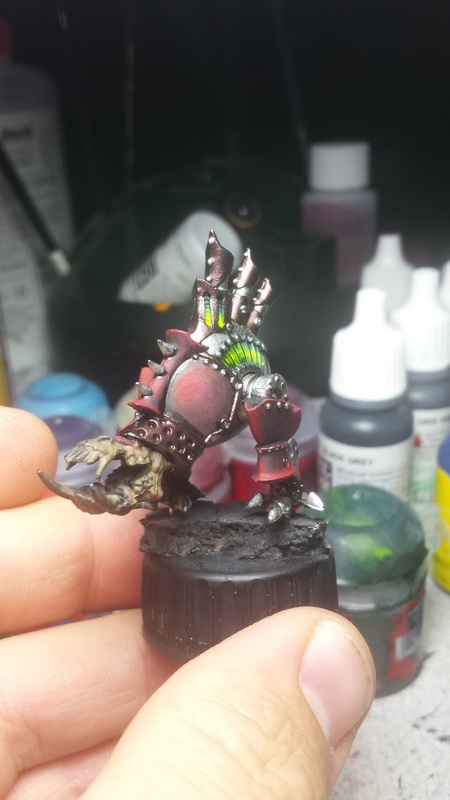 That looks like a great challenge to work on and you bring up some great points on the challenge of painting metals to look good. 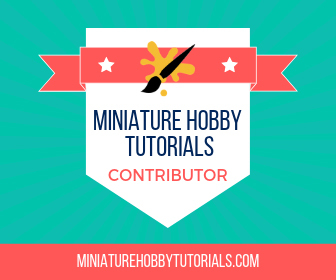 I hope you put all your findings into a tutorial for all the rest of us!